EPPING, NH – Seacoast United Sports Club, Inc. is delighted to announce an official partnership with Lonza Biologics Inc. Lonza is one of the world's leading suppliers to the Pharma & Biotech and Specialty Ingredients markets that enhance your overall quality of life. The Portsmouth facility, located at Pease International Tradeport, has played an integral role in the development of community relations and has had a profound impact on the local economy. The New Hampshire branch currently employs over 1,000 people and over 100 of their staff are actively involved with Seacoast United. "Having Lonza on board is a great win for the Club," commented James Peterson, Seacoast United's Director of Sales and Marketing. "They are fully committed to making a difference here in the seacoast area, and we feel that a partnership with them can open a lot of doors. The fact that 10% of their employee base is already involved with us shows there is a lot of synergy between the two organizations." 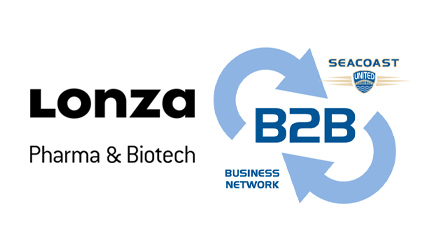 The multifaceted partnership will see Lonza have a presence at a number of Seacoast United facilities to help raise awareness about their company and the services they provide. In addition to various advertising initiatives, Seacoast United will work closely with Lonza in recruiting prospective employees for a number of their departments. "Lonza is a world renowned company and it is pretty special that they call the Granite State home. Our goal is to get the word out about their company in the hopes of bringing some talented people on board," added Peterson.